The Tinkering Woodworker delivers original plans and expert know-how for 15 cleverly designed projects that make the home, office, and leisure time more efficient and fun. The projects for the home include an entryway organizer, a knife block, Lego-style storage cubes, a clever wooden frame for hanging family art, and a stylish tripod lamp. For the home office, a standing desk, laptop and iphone stands, and headphone hooks make getting work done more efficient than ever. Remembering that all work and no play is a bad approach to life, The Tinkering Woodworker also includes a beer tap and growler caddy, a bike rack, cathouse in the shape of a teardrop trailer, and a slingshot that would make Tom Sawyer proud. With each project presented in a crisp, easy-to-follow design that guarantees success, The Tinkering Woodworker is the woodworking book that today’s makers have been waiting for. The Tinkering Woodworker was created by The Tinkering Monkey, an Oakland, California based woodworking/industrial design duo with a passion for designing and crafting smart, functional wooden products that are built to last. 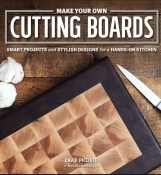 If you’re a beginner looking for a great first project or a craftsman looking to showcase a piece of treasured wood, it’s hard to deny the appeal of the cutting boards in this new book by David Picciuto, author of The New Bandsaw Box Book and host of Make Something, the projects range from simple to complex and the finished designs can be tailored to suit any style or taste. Best of all, upon completion, each project can be proudly used or given to that special loved one on your gift list. Extensive photography and clear, concise instructions make even the most complex techniques easy to understand and conquer. A gallery of inspiring designs is also included to spark your own cutting board styles. Download SketchUp and Start Drawing Detailed Woodworking Plans Like a Pro in No Time All. An affordable, simple, and powerful 3-D design program, SketchUp can be used to create models and plans for anything a creative mind can imagine, especially simple to elaborate woodworking projects and plans. 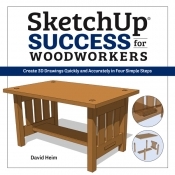 After many years of using SketchUp, David Heim, an expert woodworker and writer, has developed a simple set of rules for success that will guide you in mastering this potent program. With SketchUp Success for Woodworkers, any woodworker can download SketchUp at breakfast and be drawing detailed and useful plans by dinnertime. Easy-to-understand instructions, screen shots, and step-by-step projects make it easy to unleash the valuable benefits of SketchUp to create the models and plans that will transform your woodworking design process and elevate your woodworking output.